It was a very nice hotel, location and good restaurant downstairs. The room was nice and warm, it was exactly what we needed. I have very mixed feelings about the New Inn. Positive: GREAT location; very nice staff; incredible history and atmosphere. Literally something out of the Middle Ages. Chaucer would have been right at home. The manager went out of his way to be accommodating. Very nice staff, great location, very clean rooms, comfortable bed, and the bath was nice. Very central hotel. Listed building with quirky rooms on 2 floors. Staff member was very friendly and breakfast was good. Room was comfortable but lacked some amenities. I would probably stay there again once it was completely up and running. the location was very good and the staff helpful. very old inn with lots of character. Very nice and ample breakfasts. Real Ale well kept and a promotion of £3 a pint between 5 - 7 PM week nights, TV in the bar that showed the Six Nations Rugby and there are also Gloucester Rugby Flags on the ceiling of the bar. The staff were helpful and courteous. 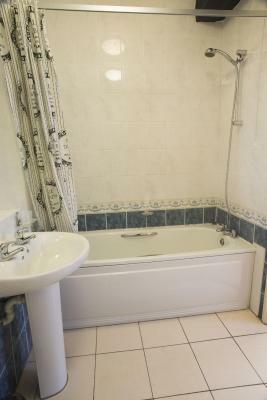 The en-suite was great with a large bath. This hotel is located in an old, historic building in Gloucester. It has a lot of character. It's in a great location to walk down the main street/city center. As with most hotels in the area, there was no on-site parking, but there was a very affordable parking garage (King's Walk) right at the end of the street. There's a bar, restaurant, coffee shop all on site, which was very convenient. The price for this hotel was very good. Bed was ok, Breakfast was good. Bathroom was clean and spacious. TV worked. beds were comfy and the cooked breakfast was enjoyable and non greasy. the whole building was full of oldie character and history. great location. The New Inn – RelaxInnz This rating is a reflection of how the property compares to the industry standard when it comes to price, facilities and services available. It's based on a self-evaluation by the property. Use this rating to help choose your stay! 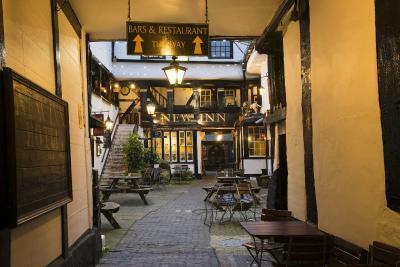 One of our top picks in Gloucester.In the heart of Gloucester, the 15th-century New Inn features a medieval courtyard, real ale pub and free Wi-Fi. There is also a traditional restaurant with period features. 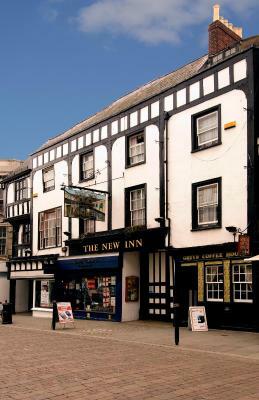 Beautifully restored, The New Inn Hotel has cozy rooms with exposed beams and original features. All rooms have a private bathroom, tea and coffee facilities and a TV. The Pilgrims Restaurant serves a traditional roast meal and British menu in charming surroundings. 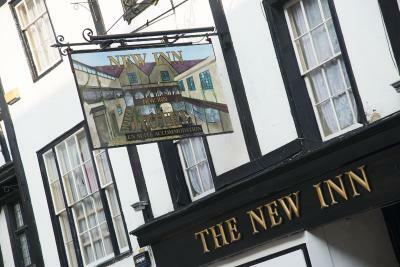 The New Inn has 4 bars, including the award-winning Real Ale Bar, serving up to 12 cask ales. There is also a coffee shop with homemade cake and specialty teas. The ancient courtyard has galleries on all sides, and the historic building was used by pilgrims visiting Gloucester Cathedral, which is just 950 feet away. East Gate Shopping Center is just a 2-minute walk away, and Gloucester Train Station is a 5-minute walk from the property. When would you like to stay at The New Inn – RelaxInnz? This room with original wood beams has a double bed and a shower, guests can request a bathtub if they prefer. Room amenities include Freeview cable TV and tea/coffee making essentials. Standard room with original wood beams has 2 single beds and a shower, although guests can request a bathtub if preferred. Room amenities include Freeview cable TV and tea/coffee making essentials. Standard room with original wood beams has a single bed and a shower, although guests can request a bathtub if preferred. Room amenities include Freeview cable TV and tea/coffee making essentials. Grand four-post bed in a room with original wood beams and a shower, although guests can request a bathtub if they prefer. Room amenities include Freeview cable TV and tea/coffee making essentials. Traditionally designed triple bedroom with original wood beams has one single and one double bed. The suite comes with a shower, although guests can request a bathtub if they prefer. Room amenities include Freeview cable TV and tea/coffee making essentials. Spacious room for a family of four with original wood beams and has one comfortable double bed with one sofa bed and a shower, guests can request a bathtub if they prefer. Room amenities include Freeview cable TV and tea/coffee making essentials. The finest surviving example of a 15th century galleried inn. We have been providing great food, drink and entertainment to the public for over 500 years, and continue to do so! House Rules The New Inn – RelaxInnz takes special requests – add in the next step! Up to three children under 16 years are charged GBP 10 per night when using existing beds. The New Inn – RelaxInnz accepts these cards and reserves the right to temporarily hold an amount prior to arrival. 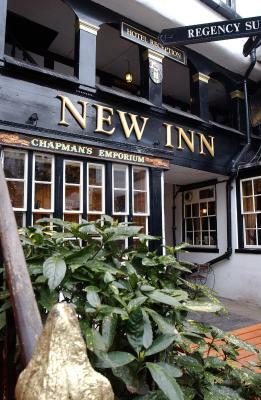 The New Inn is a Grade I listed building, and has no disabled facilities. Bedrooms are located on the 1st and 2nd floors. Check in times from 14:00 to 21:00. Late check ins only by prior arrangement. 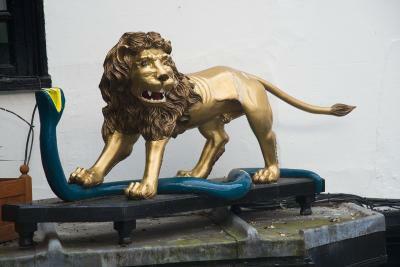 The nearest car park is Kings Walk (GL1 1EA) which is at the rear of the property. This parking costs GBP 6 per day Monday - Saturday and GBP 2 on Sundays. It is free between 17:00 and 07:00. Alternatively, Bruton Way NCP car park (GL1 1DG) is located opposite the railway station and is an 8 minute walk from the property. The parking is pay on exit and costs GBP 3 for 24 hours. High vans should use Hare Lane North car park (GL1 1DF). It is free between the hours of 18:00 and 07:00 and costs GBP 3 per day Monday - Saturday and GBP 2 for Sundays. Passengers and luggage may be dropped off at the back door in New Inn Lane - close to Kings Walk car park. The property hosts live music every Friday until 00:00, and karaoke on Saturdays until 00:00. The bar and courtyard can be very busy and noisy. the location is excellent and breakfast was delicious. Unclean, uncomfortable, dirty washing left outside our room for the duration of our stay. Unfortunately left a valuable item behind. Staff refused to post or even help us get the item back to us. Very disappointed. Great value so let's be fair and the staff were so friendly and helpful. Nothing we didn't like. Breakfast not great, menu implied lots of fruit at breakfast and yoghurt. than didn't happen, a pot of weird yoghurt, would have liked plain to mix with fruit, That was our expectation although lovely white bread for toast! Our room was above the bar, so was noisy until midnight, definitely not suitable for families. Poor shower head, crack in sink. Shortage of milk in room, odd cups and only one teaspoon. Bedroom needs a luck of paint. Shabby looking. Bed base very stained and cover ripped. Period features are lovely but everything is very tired. Breakfast was buffet style. Very little choice and everything Luke warm. location great center of town, Parking reasonably nearby very reasonable. Good value for money. The noise from the entertainment right under our room Friday and Saturday night. The history and quirkiness of the hotel and its closeness to the train station. External stairs to negotiate in all weather to get to your room, and down for breakfast. Next set narrow and steep. No parking near by. If you eat in the bar your food has to be carried across the open courtyard, glad it wasn't raining when we ate. Food was average. Breakfast was good. ?? Convenient for city centre, although city centre very small. Good breakfast. Can't think of anything I didn't like. It does what it says on the tin! Superb. We were astounded to find a reasonably priced good hotel, being a magnificent coaching Inn from 1455 (yes, Grade 1 listed)) in wonderful preservation, right in the centre of Gloucester, close to the Cathedral, which is itself an ancient wonderful building, and which you just must visit for stained glass, architectural sculpture, and the burial of King John himself, of Magna Carta fame . 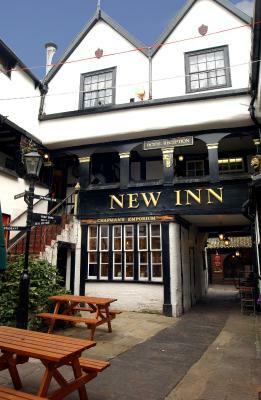 When it was built in the times of the Earls of Gloucester, the New Inn was the largest coaching inn in the whole of Britain. Now it is cosy with restaurant and several bars. Worth staying at for an experience, and good value central accomodation, with superbly preserved historical associations. It was Karaoke night which was super super loud until 12.30am and whilst normally we would join in we had plans the next day so were hoping for a good nights sleep. Not good if you have children. We were not warned at all and I’d really recommend the hotel provide earplugs for guests should they need them. Very cool old building and the four poster suite was amazing! Great location and right in the centre of Gloucester. Breakfast was huge!